National Register of Citizens: Has Assam’s Muslim population increased because of Bangladeshis? Fact check: Are illegal Bangladeshi migrants responsible for increase in Assam's Muslim population? As National Register of Citizens is updated to identify illegal immigrants, a former statistics professor’s book busts a few myths about the state’s demography. Census reports have long been a pivot of Assam’s politics, spawning anxiety among its people that “unabated infiltration” from Bangladesh would endanger their cultural identity. It is claimed that the influx from the neighbouring nation is why Muslims have grown from being 24.68% of the state’s population in 1951 to 28.43% in 1991 and 34.22% in 2011. It is a myth that Infiltration: Genesis of Assam Movement busts conclusively. The book, published last year, is written by Abdul Mannan, former professor of statistics at Gauhati University. He concludes that Assam’s Muslim population has increased because of the community’s high birth rate and not because of illegal immigration from Bangladesh. Illegal immigrants in Assam are estimated to number between 16 lakh and 84 lakh, in a total population of 3.12 crore according to the 2011 Census. In the 1950s and 1960s, successive Congress governments expelled lakhs of Bengali Muslims from Assam on the ground that they were illegal infiltrators from what was then East Pakistan. It was not until Bangladesh became an independent country in 1971, however, that popular anger against the so-called foreigners acquired intensity. 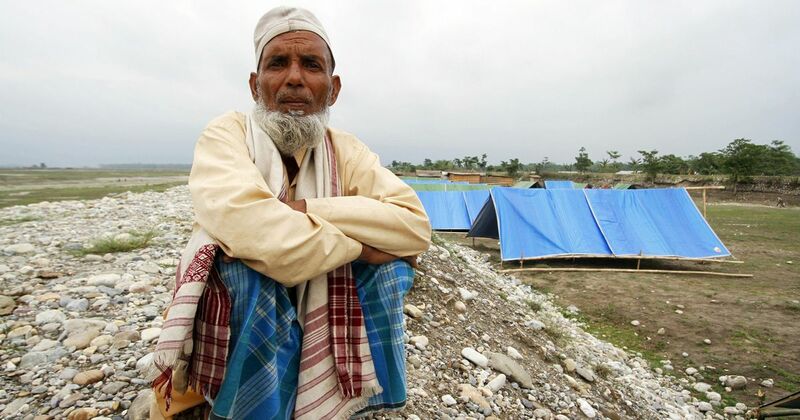 Bangladeshi Muslims were perceived to be flooding into Assam through the porous border to escape poverty. 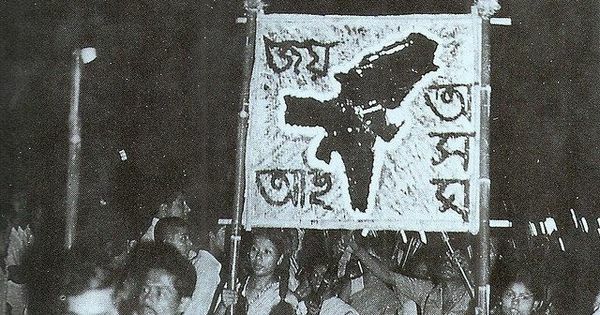 By 1979-80, the All Assam Students Union was spearheading the anti-foreigner movement, cashing in on wild estimates of the number of Bangladeshi immigrants to gain wide support. One estimate numbered the Bangladeshis at 45% of Assam’s estimated population of 1.6 crore in 1981. Such claims were hard to refute, not least because the 1981 Census could not be conducted owing to the Assam agitation, then at its peak. 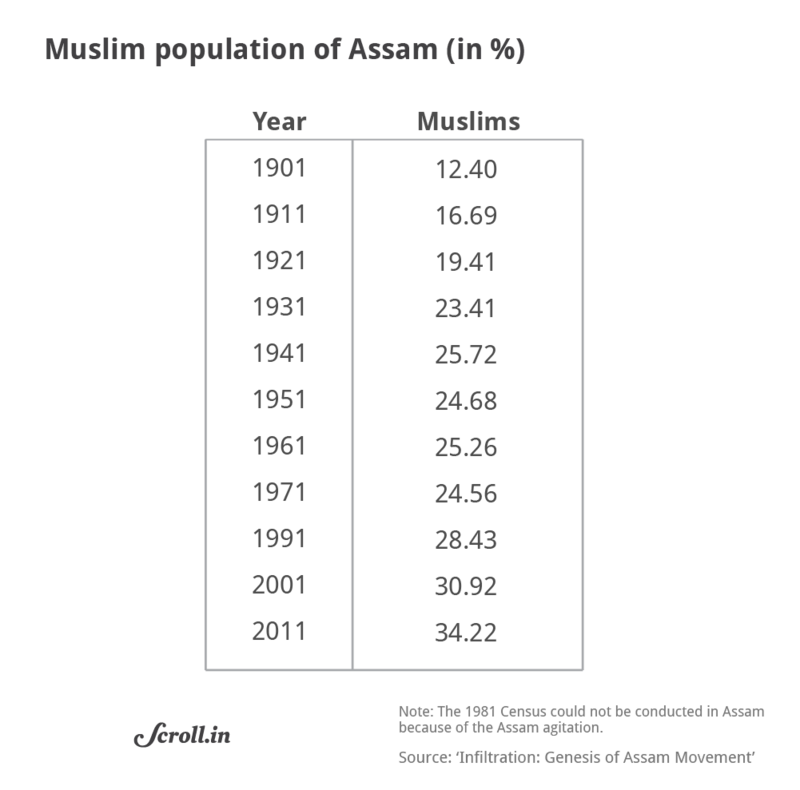 In 1991, the Census reported that Muslims were 28.43% of Assam’s population, up from 24.56% in 1971. Several publications interpreted these figures to reach an alarming conclusion: Bangladeshis were demographically colonising Assam. For instance, Asam Bani, a popular weekly, claimed in its August 18, 1994 edition that 16 lakh Bangladeshis had entered Assam between 1971 and 1991. Who were they? Muslims, Asam Bani declared, after analysing the Census data. Since Hindus had a growth rate of 41.89% in 1971-1991 and Muslims 77.42%, the weekly argued that the excess growth rate of Muslims was primarily because of the Bangladeshis. It further argued that had the influx from Bangladesh been negligible, the growth rate of Muslims would not have exceeded 45%. Why? It did not offer a reason. Still, such claims became common sense in Assam. It is this common sense that Mannan challenges: the rise in Assam’s Muslim population was not unusual and it was not a consequence of immigration from Bangladesh. After all, the all-India growth rate of Muslims between 1971 and 1991 was 71.47%, just a little lower than the 77.42% that the Muslims of Assam clocked in the same period. 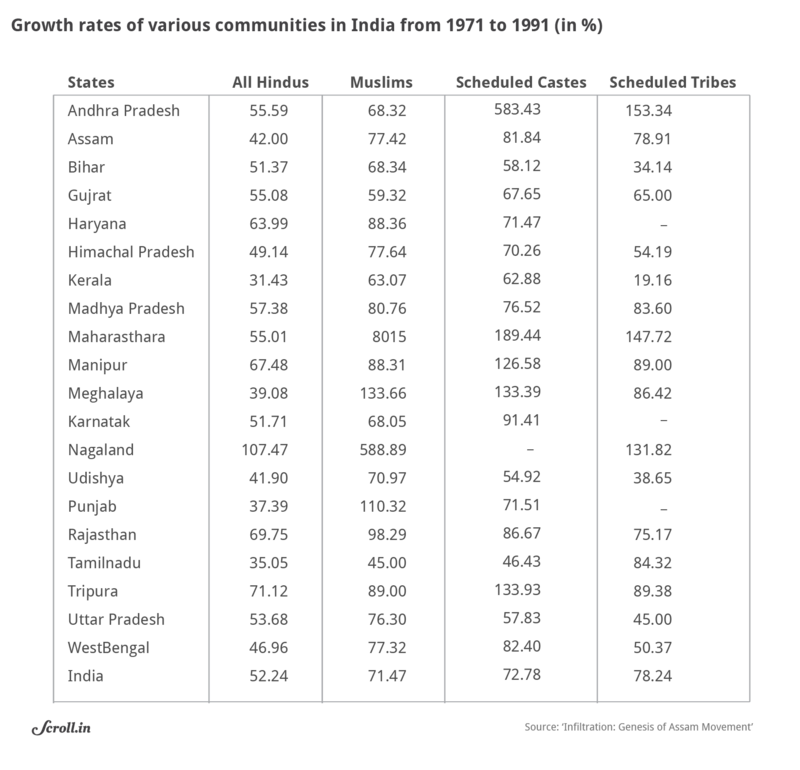 More significantly, the growth rate of Assam’s Muslims in 1971-1991 compared favourably with the community’s growth rate in states such as Uttar Pradesh (76.30%), West Bengal (77.32%), Madhya Pradesh (80.76%), Rajasthan (98.29%), Tripura (89%), Punjab (110.32%) and Himachal Pradesh (77.64%). Barring Punjab, all these states have always had sizeable Muslim populations. Certainly not on account of Bangladeshi infiltrators, with West Bengal perhaps being the exception. The growth rate of Hindus (41.89%) in Assam in 1971-1991 was indeed much lower than that of Muslims (77.42%). But parsing this low growth rate throws up a story: Assam’s Scheduled Castes and Scheduled Tribes grew at a higher rate than even Muslims – Scheduled Castes at 81.84% and Scheduled Tribes at 78.91%. Referring to these trends, Mannan asks: Is the higher growth rate among Muslims, Scheduled Castes and Scheduled Tribes linked to poverty, illiteracy and social backwardness? He proceeds to answer this question through another statistical comparison. 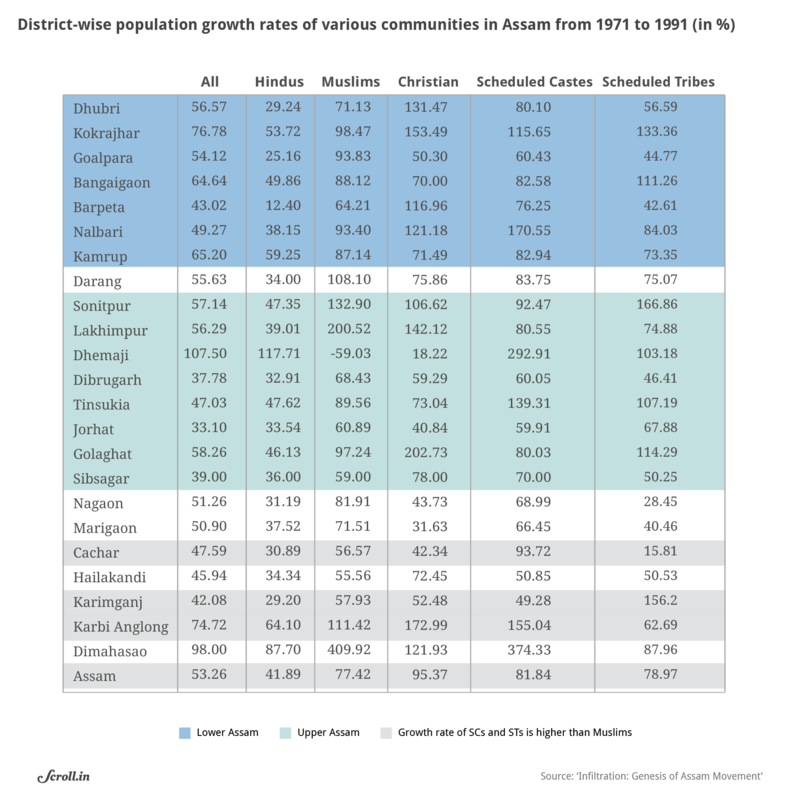 Table 3 shows the growth rates of various communities in each of Assam’s 23 districts between 1971 and 1991. (There are now 33 districts). The growth rate of the Scheduled Castes is higher than that of Muslims in 10 districts. In eight districts, the Scheduled Tribes outstrip the growth rate of Muslims. Significantly, Mannan compares the growth rates of Muslims in Upper Assam and Lower Assam in this period. This is because Muslims in Upper Assam are largely of indigenous origin while Lower Assam is home to Muslims of Bengali origin. The latter are not infiltrators. They are descendants of Bengali Muslim peasants settled by the British in marshy and riverine areas of Assam to boost agriculture. Some also migrated voluntarily in search of livelihood, but, in undivided India, they were just moving from one part of the country to another. Assam’s districts have been repeatedly divided to create new ones, leading to a peculiar trend in Dhemaji. When this district was carved out of Lakhimpur in 1989, a large number of Muslims moved to the latter for reasons of livelihood. Dhemaji thus registered a negative growth rate for Muslims, as Table 3, prepared soon after the new district was created, shows. Leave out Dhemaji as an anomaly then. In all other districts of Upper Assam except Jorhat and Sibsagar (now Sivasagar), the growth rate of Muslims was over 68%. In Jorhat, it was 60.80% and in Sibsagar 59.01%. What Jorhat and Sibsagar have in common is a high literacy rate. In 1991, it was 65.89% for Jorhat and 64.84% for Sibsagar, much higher than the state average of 52.89%. The high literacy rates are a consequence of their relative prosperity – a large number of Assam’s tea gardens and oil fields are concentrated in these two districts, and they hum with business. Literacy and prosperity translated, not surprisingly, in the low growth rate of Hindus in Jorhat (33.54%) and Sibsagar (35.91%). But why was the growth rate of Muslims still substantially higher than that of Hindus in the two districts? “The reason may be the social backwardness and relative poverty among Muslims,” Mannan suggests. Mannan then turns the spotlight on Table 4, based on the Census figures of 2001 and 2011. It shows that districts with a growth rate of 21% and above also have a high percentage of Muslims. What explains this phenomenon? Mannan chooses two districts – Jorhat and Dhubri – for comparison. In 2001-2011, Dhubri registered the highest growth rate (24.4%) among all districts of Assam. 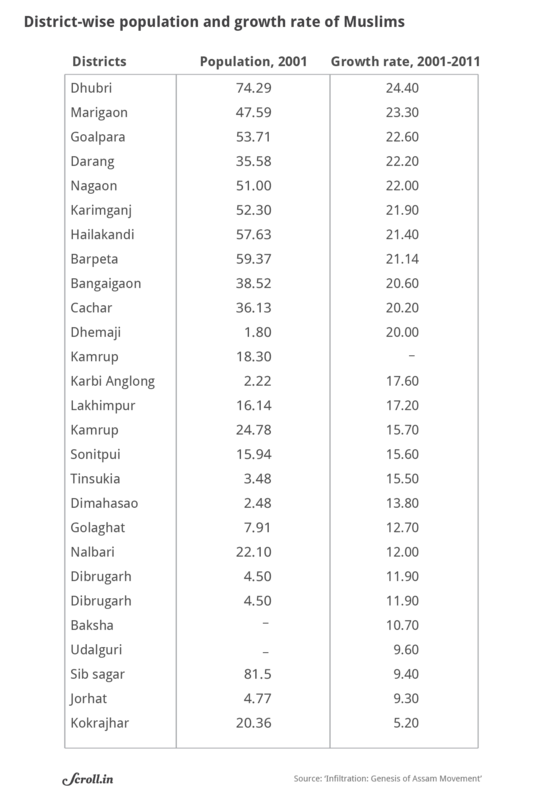 By contrast, Jorhat clocked the lowest growth rate of 9.3%. This gulf between the population growth rates was mirrored in other social indicators. Dhubri had an infant mortality rate of 72 in 2011 as against Jorhat’s 57. In Dhubri, there was a doctor for every 10,844 people as compared to one for every 7,189 people in Jorhat. Dhubri’s literacy rate of 48.21% was far behind Jorhat’s 76.21%. There was one lower primary school for every 1,129 people in Dhubri as against one for every 638 people in Jorhat. Dhubri had a bank branch for every 29,239 people while Jorhat had one for every 11,355 people. The per capita loan disbursal in Jorhat was three times more than Dhubri’s. It is truism in demographic studies that population explosion is a consequence of poverty, illiteracy, insufficient health and sanitation services, and a sluggish economy. “This is precisely true of Assam too,” Mannan writes. Mannan says he is certain that if the ongoing exercise to update the National Register of Citizens is carried out honestly, Bangladeshi Muslims in Assam will be counted in thousands, not in lakhs. Regardless of how many Bangladeshi Muslims the National Register of Citizens identifies, there is no denying that the truth about Assam’s demography was sacrificed on the altar of politics. It seems spurious theories about Bangladeshi Muslims were spun not out of ignorance, but with intent. In this, two Assam police officers and the Rashtriya Swayamsevak Sangh played a crucial role. The RSS deftly turned the All Assam Students Union’s movement against outsiders, that is, Indians from other states, into one against foreigners, that is, Bangladeshi Muslims. The second part of this series will look at how the two police officers and the RSS changed the course of the Assam movement.